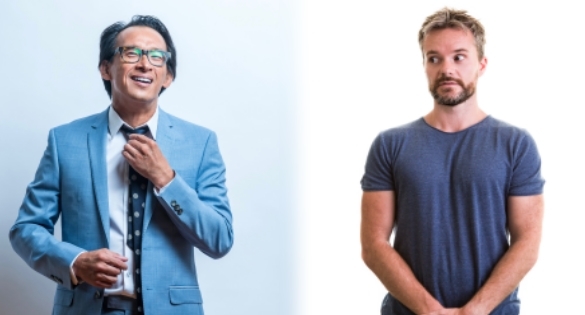 Leading comedians Raybon Kan and Nick Rado team up to perform a two-hour show in which stand-up gives way to Rado & Raybon solving questions posed by the audience. The first half is a stand-up set by each comedian. In the second half, they take the stage together and answer questions, throwing fuel on the burning issues as determined by the audience on the night. They guarantee the world will not end during the show. Nick Rado is the Head Writer for TV3’s award winning panel show 7 Days, guest comedy writer for TV3’s The Project and has recently just finished a nationwide NZ tour opening for Danny Bhoy. He’s won the NZ Comedy Guild’s Best MC award four times. He also appeared in Netflix’s Rhys Darby show ‘Short Poppies. Raybon Kan (Best Comedian, Metro; Best Comedian, North & South) has performed at major comedy festivals such as Montreal’s Just for Laughs (twice), Edinburgh and Melbourne, where The Age declared his show ‘Dazed and Confucius’ one of the festival highlights. His shows have sold out throughout NZ.